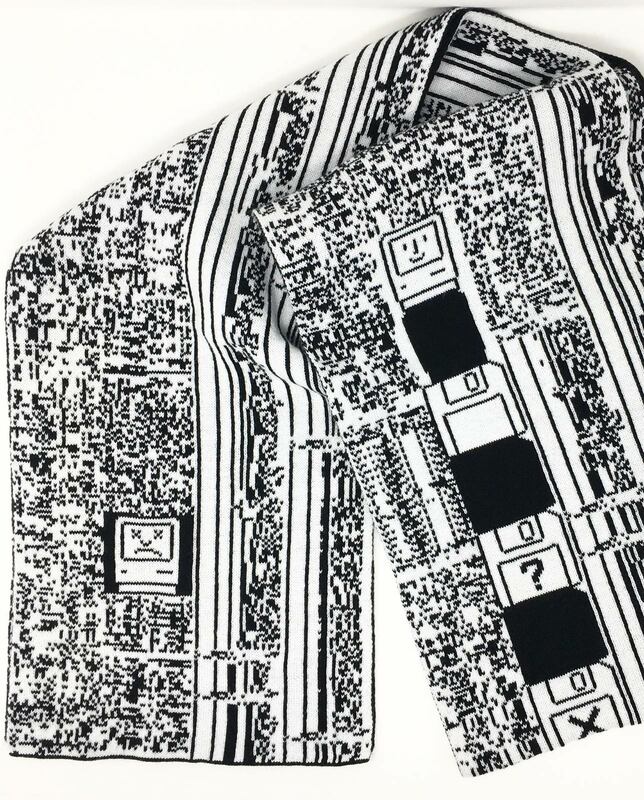 These Mac ROM scarves will boot up your fashion game. Code to keep your neck warm. You could safely assume that computer hackers and people who knit have little to talk about. One activity is clearly analog and seemingly old-fashioned while the other pre-occupies the mind of a tech geek. Fabienne Serriere blows up that assumption by being both. She combines the two rather different activities to make eye-catching scarves imprinted with Mac ROM code. ROM is built-in computer memory containing data that allows users to boot up or turn on their machines. The codes vary from computer to computer but in the case of Macs, Apple engineers hardcoded now-familiar images into the ROM, including happy-faced Macs and floppy disks. 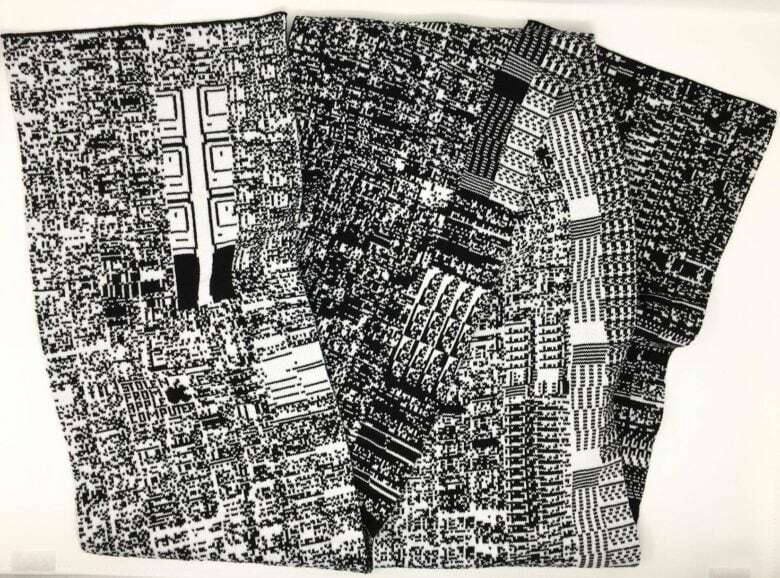 A hacker friend of her’s writes code to convert the 0s and 1s of ROM to pixels and Serriere selects interesting slices for the print to upload to her 3,000-pound industrial knitting machine in her Seattle studio. A conversation with Serriere quickly reveals a curiosity that will not be pigeonholed. She has a playful passion for math, vintage computers, and diving into odd challenges just to see what happens. 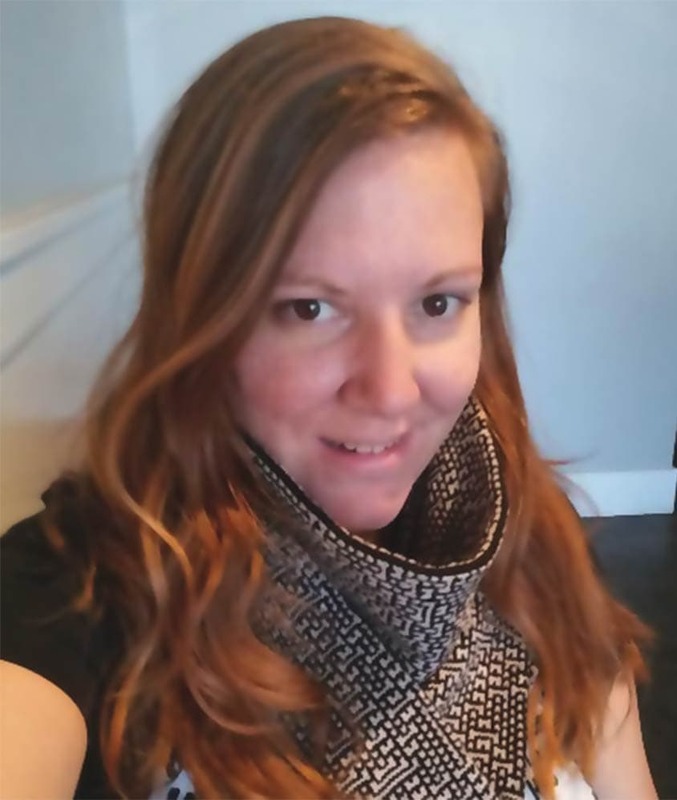 KnitYak started in 2015 when Serriere raised more than $125,000 on Kickstarter to purchase an industrial knitting machine to make computational scarves featuring cellular automata, the mathematical patterns of cells on a grid. The idea of marrying lines of code with lines of thread started a few years before then when she successful hacked a knitting machine at a hackathon. She has been hacking knitting machines ever since. In order to transfer algorithmic designs to the surface of the looped fiber, she has to circumvent the code that controls the machine to get it to respond to codes on her computer. Serriere also makes scarves featuring the enchanting fractal curls found in a particular set of complex numbers known as the Mandelbrot set. ROM code from a Quadra 660AV Mac. Her scarves are an acrylic, mostly black and white knit and made in small batches. Even at $109, the scarves sell-out fast. Only one Mac scarf remains from the holiday season and she is currently working on new inventory that will hit the KnitYak website soon. The Mac ROM codes shine as a fashion accessory because of the hard-coded icons. One scarf features the code from a Power Mac 5200 with Mac characters both happy and sad. 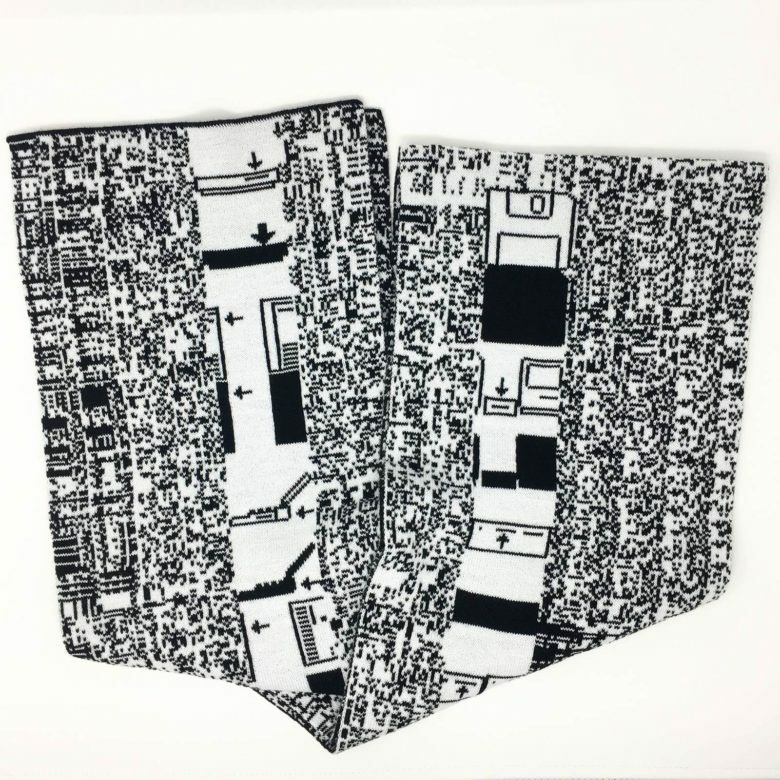 It also includes a series of disk images and the data tracks that frame the icons form the shape and flow of the print on the scarf. ROM code from the PowerBook 190cs. Other slices come from the ROM of a Macintosh IIfx, another from the PowerBook 190cs. Scarves made from slices of code from the Quadra 660AV Mac feature large numbers from 0 to 6. Macs happy and sad from the Power Mac 5200. Her machine produces a scarf in 25 minutes, then she puts in another 15 minutes to hand-finish the ends. Each scarf comes with a printed copy of the source code.